Students watch as smoke slowly rolls through campus. 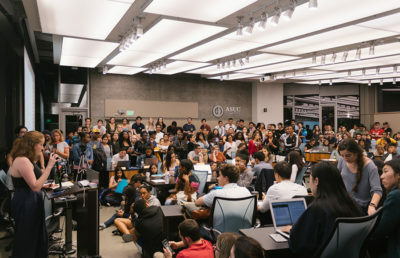 UC Berkeley received national media attention Monday night following a bizarre series of events that culminated with an explosion near California Hall and the swift evacuation of campus. By midnight, the campus was eerily dark, empty except for the flashing lights of fire engines and the haze of lingering smoke. It began with a campuswide power outage at 4:30 p.m.
Students in Doe Memorial Library, who were evacuated when the lights shut off and fire alarms were triggered, were surprised to find that students in Moffitt Library and other buildings were experiencing similar confusion. 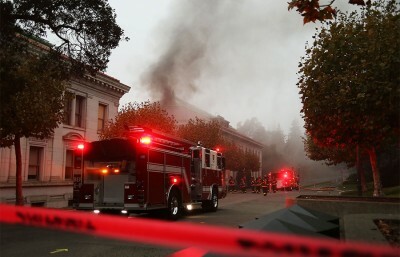 Within 15 minutes, both UCPD and Berkeley Fire Department were responding to reports of black smoke at locations across campus. According to Acting Deputy Fire Chief Avery Webb, firefighters at Koshland Hall discovered a plume of smoke coming from a backup generator. That was when the calls started pouring in, Webb said. BFD dispatchers, hearing reports of smoke clouds, strange odors and people trapped in elevators campuswide, quickly passed word on to crews across the city. “The system was on the verge of being overwhelmed by calls coming in from different places,” Webb said. By 5:15 p.m., Berkeley Fire Department was so overwhelmed with calls that officials requested crews from Alameda County Fire Department to cover duties at fire stations in the city, Webb said. 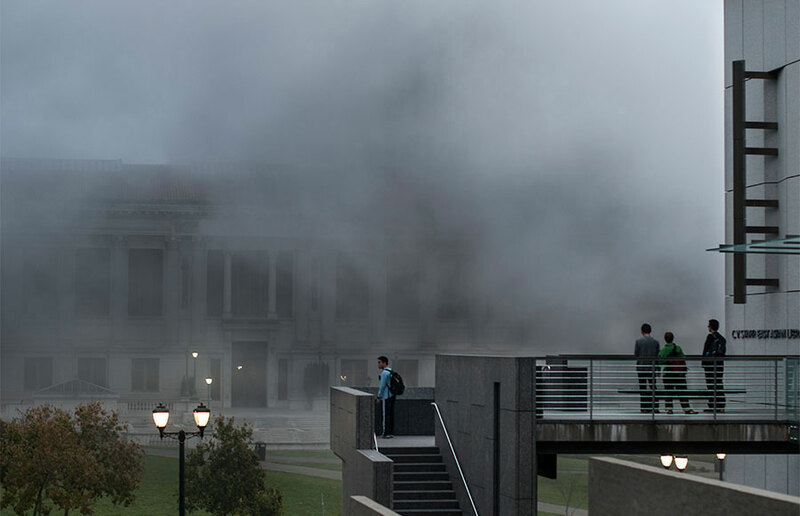 Meanwhile, a similar spectacle developed outside Sather Tower in response to the release of smoke from another underground generator. One of the backup generators, which automatically starts in the event of a widespread power outage, was running and emitting smoke, which is typical of the system, said UCPD officer Barry Boersma. UCPD, along with Berkeley Police Department and BFD, was present at the scene. 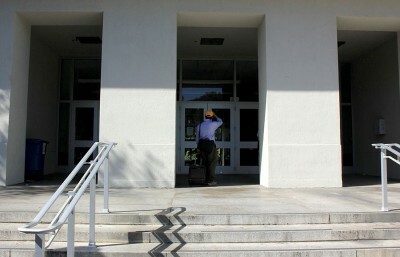 About 5:20 p.m., firefighters evacuated Latimer Hall after students and faculty smelled ammonia in the building. According to Webb, the chemical escaped into the building when a laboratory circulation fan shut down after the power outage, but concentrations were never high enough to cause serious harm. As responders began to stem the tide of stuck elevators, a lull in the action emerged about 6 p.m.
“It looked like things were winding down,” Webb said. About 6:40 p.m., the lull ended. Officials at their makeshift command post on the west side of the Campanile turned abruptly at the sound of a large explosion originating from an electrical vault just downhill, according to UCPD Lt. Marc DeCoulode. Campus sophomore Jennifer Han was walking past Wheeler Hall on her way home from a midterm review session when the explosion sent her and other students sprinting in the opposite direction. A fire engine waiting to respond to another call was parked just 30 to 40 feet away from the explosion, DeCoulode said. Four people sustained minor injuries from the blast, one of whom was taken to the hospital to be treated for minor burn injuries. At the command post, DeCoulode and other leaders made a quick decision to evacuate the campus. A number of similar electrical vaults are spread across campus, and first responders were worried they would burst as well, he said. Officers spent the rest of the night checking buildings for malfunctioning elevators and other problems, DeCoulode said. UC Berkeley will now begin investigating the events that led up to the power outage and explosion, said campus spokesperson Dan Mogulof. 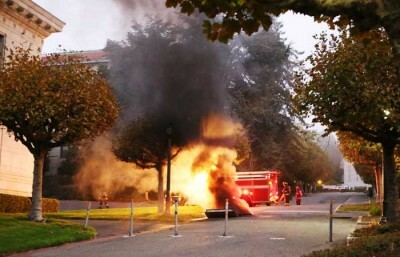 Authorities determined early on that the power outage was caused by damage from vandals attempting to steal copper ground wiring in a manhole a half-mile east of campus. Whether this is also related to the explosion is still unknown, Mogulof said. An entry from the UCPD crime log shows a burglary of copper wire and other ground wires was reported on Sept. 17 at the Big C Trail. UCPD Lt. Eric Tejada confirmed that this burglary is the incident officials believe is related to the outage and said that high-voltage wire was stolen. Mogulof said the vandals had a sophisticated understanding of what they were doing due to their ability to locate the access point and the amount of pressure they were able to apply to the wiring. “These are people who understand their illicit business and know where the access or weak points are of any electrical grid,” Mogulof said. Another explosion occurred nearly three weeks ago in an underground high-voltage vault, causing a power outage in several buildings. At the time, officials said that the explosion, located near Evans Hall, was a result of construction. Mogulof said the campus has no reason to believe the two incidents are related. Chase Schweitzer contributed to this report.